Since ancient times, children have played imagining that they are riding a horse and over the centuries the toy horse has taken on a wide variety of forms. 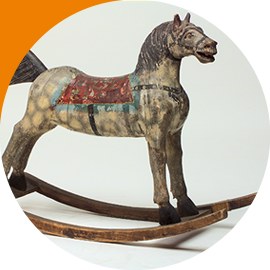 A favourite toy for children who could already walk was a pull-along horse on wheels. Riding a stick was a way to copy adults riding a horse. The first rocking horses date to the seventeenth century. They were genuine masterpieces of workmanship for children belonging to well-to-do families. 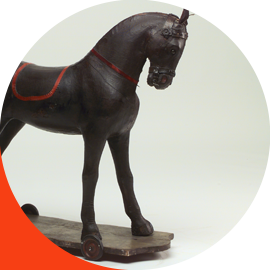 In the nineteenth and twentieth centuries, new materials and techniques made toy horses simpler and cheaper becoming a staple in the rooms of many children. 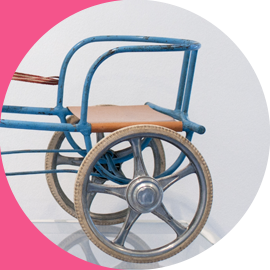 Ingenuity and the care for children have created a huge array of different types of toy horses in the course of time: from fine rocking horses to more rudimental ones, from merry-go-round horses to toy horses on wheels, from stick horses to small wagons. The rocking horse made its debut in the seventeenth century: as time went by, riding sticks started to be decorated with a horse head and fine and elegant ornaments, ultimately becoming rocking horses. A 1610 rocking horse on display at the Victoria & Albert Museum in London dates from 1610 and is believed to be the first rocking horse ever made. 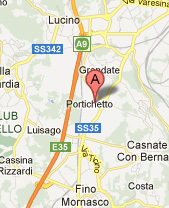 The known pieces were made of wood, papier-mache or metal and often covered with animal fur and lavishly decorated. They were made for the children of aristocratic families, since it was absolutely necessary for an aristocrat to know how to ride a horse. 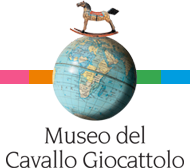 The first documented carousel like the merry-go-rounds we know date from the sixteenth century. 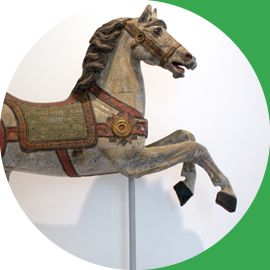 In the eighteenth century, handwheel-operated carousels were built and featured wooden horses alternated with chairs. The carousel was invented in Europe, but it reached its acme in the United States. The golden age of merry-go-rounds lasted about two decades, from 1905 to 1925. 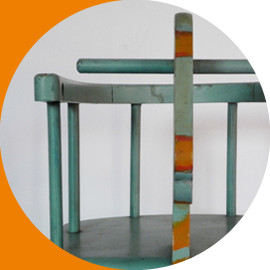 The first horse-shaped chairs made their debut in the United States toward the end of the nineteenth century. Almost two centuries after the invention of the rocking chair (which also appears in seventeenth-century Flemish paintings), rocking chairs with a horse head were made for the fun of younger children. A backrest and armrests surrounded the child ensuring protection and preventing falls so these seats could also be used for children who weren't able to sit up yet. 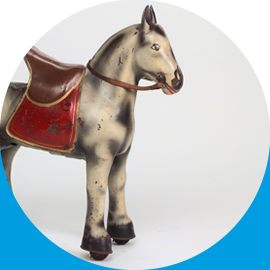 A favourite toy of children who could already walk was a pull-along horse on wheels . By pulling it with a string, the horse would tamely follow the child. It did not take very long before these pull-along horses on wheels became large enough to bear the weight of a child and in a short time these toys started to be made for riding. Many horses have a hole through their nostrils or a wooden stick to fasten the bridle. The French are believed to have invented the bicycle and they also made a name for themselves in mechanical toys. In 1821, the two inventors Jean Louis Gourdoux and M. Combe were the first to patent the tricycle horse. 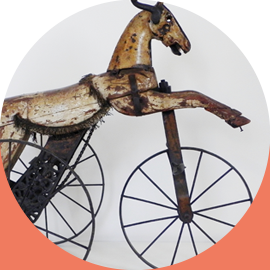 The oldest pieces, like the first bicycles, had large iron wheels and moved by pedalling with hands using handles on the horse's head. The roots of the bond between humans and horses delve far back into time and since antiquity humans have tamed and ridden this noble animal. Horse races were a form of entertainment for people and since adult life is often mimicked by children and the facts of life are transformed into games, horses with a sulky (a light 2-wheeled cart having a single seat) have always been a toy that every child has wished for. Imitating adults and their games has always been the favourite way to play. The history of the spring horse goes hand in hand with that of tin litograph horses. The heyday of this toy was reached between the 1940s and the 1960s. A spring system and saddle were able to shift the weight to the legs, making them move just like a real trotting horse. The cheap price of tin and the life like movement of the horse made this toy a big hit. The largest manufacturers were based in Germany and the UK where D Sebel&Co made the famous MOBO horse. 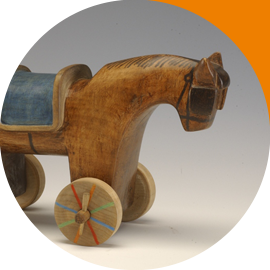 The tatà was a wooden carved animal with wheels typical of farm communities and it was the favourite toy of children living in the Val d'Aosta region in Italy. This unusual name, tatà, was borrowed from “taa-ta”, a word used by children to describe the sound made by the wheels of these toys. Horses with wheels are toys that reach far back into time, as testified by the findings from pre-Roman times in the Como area. To date, the Museum has 16 pieces of this type of toy and obviously they are all horses.